"Volume 38 covers band dispersion in chromatography; structural stochastic concepts, applications to peak shape analysis, and the characteristic function method in the stochastic theory of chromatography; the capabilities and applications of solvating gas chromatography; and more." "Reviewer praise for previous editions. . . . . .reflects the high standards expected from this respected series. " ". . .the articles are of high scientific standard, up to date, very well written, and interesting to read. . .well presented and edited. " 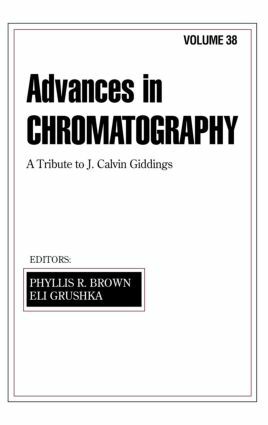 ". . .a valuable contribution to the chromatography literature. . .belongs in every library used by chromatographers. " ". . .maintains the high quality that chromatographers have come to expect from this valuable series. " Band spreading in chromatography - a personal view; the stochastic theory of chromatography; solvating gas chromatography using packed capillary columns; the linear-solvent-strength model of gradient elution; high-performance liquid chromatography-pulsed electrochemical detection for the analysis of antibiotics; theory of capillary zone electrophoresis; separation of DNA by capillary electrophoresis.